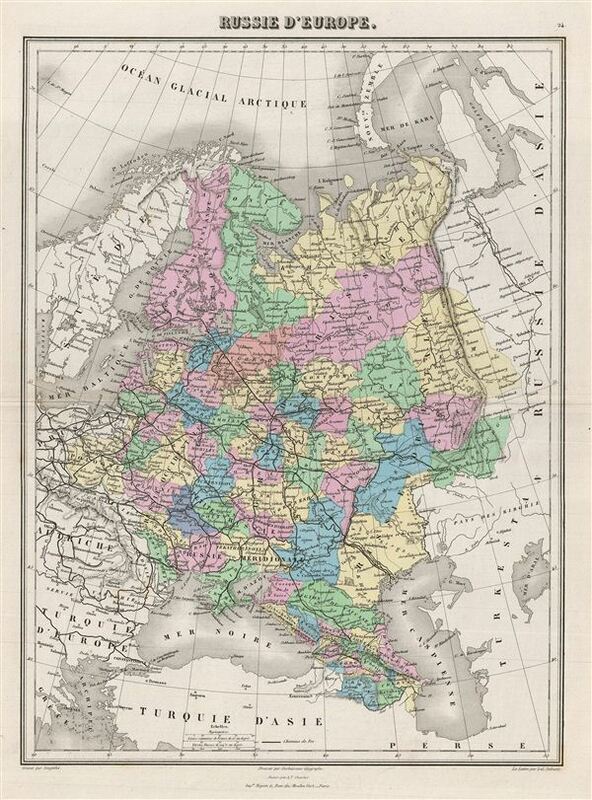 This is a fine example of J. Migeon's 1878 map of european Russia. The map covers from the Arctic Ocean to the Black Sea and from Sweden to Tartary. Parts of Austria, Prussia and european Turkey are also included. Russia at this time was under the suzerainty of Tzar Alexander II. Alexander is best known for his liberal reforms including the emancipation Reform of 1861 which liberated Russia's countless serfs and is considered to be one of the most important events in 19th century Russian history. Migeon identifies various rivers, mountain passes, lakes and other topographical features . Migeon's Geographie Universelle, published in Paris, is one of the last great decorative atlases of the 19th century. It contains many stylistic elements of early 19th century cartography such as full hand coloring, numerous decorative vignettes, and high quality paper. This map was issued as plate no. 24 in Migeon's Geographie Universelle.